The outer Eta layer that is composed of pure zinc. The photomicrograph below illustrates the order of these layers. The Diamond Pyramid Number (DPN) listed under each layer’s name is a measurement of the layer’s hardness. The higher the number, the greater the hardness. 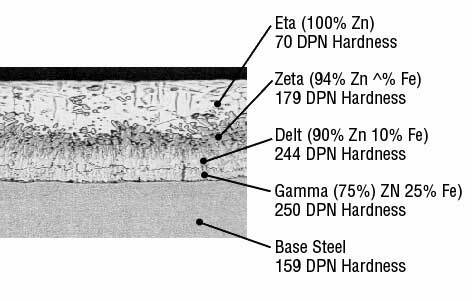 The hardness of the Gamma, Delta and Zeta layers provides exceptional protection against coating damage through abrasion, while the more ductile Eta layer provides the coating with some impact resistance. Galvanized coating is more adherent to the underlying steel than any other coating available. This, combined with hardness and ductility, provides the galvanized coating with unmatched protection against damage caused by handling or use. In addition, while organic forms of barrier protection (such as paint) are permeable to some degree, galvanized coatings are impermeable.